The Dow Jones Industrial Average closed down 586 points yesterday (Monday), marking the eighth-worst point drop in the Dow's 133-year history. On "Black Monday," the Dow Jones closed at 15,872.22, which was a 3.56% drop. The biggest point drop in the history of the Dow Jones Industrial Average happened on Sept. 29, 2008, when the index plummeted 777 points, or 6.98%. This chart shows how badly the financial crisis of 2008 hit the Dow Jones. Four of the top five biggest losses happened between September and December 2008. Yesterday's drop for the Dow Jones Industrial Average came on the heels of a 530-point drop on Friday. That was the 10th-largest drop in the index's history. 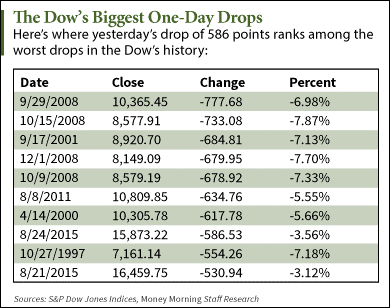 While these point drops were all massive, they're nothing compared to the index's largest percentage drops. On the original Black Monday (Oct. 19, 1987), the Dow plunged more than 22.6%. The second-largest percentage drop was Oct. 28, 1929, when it dipped 12.8%. At one point in early trading Monday, the Dow Jones Industrial Average was down 1,089 points. That was the biggest intraday point loss in the Dow's 133-year history.